I was slightly confused when I was looking through the stouts I've reviewed earlier and realized I hadn't done this one yet. 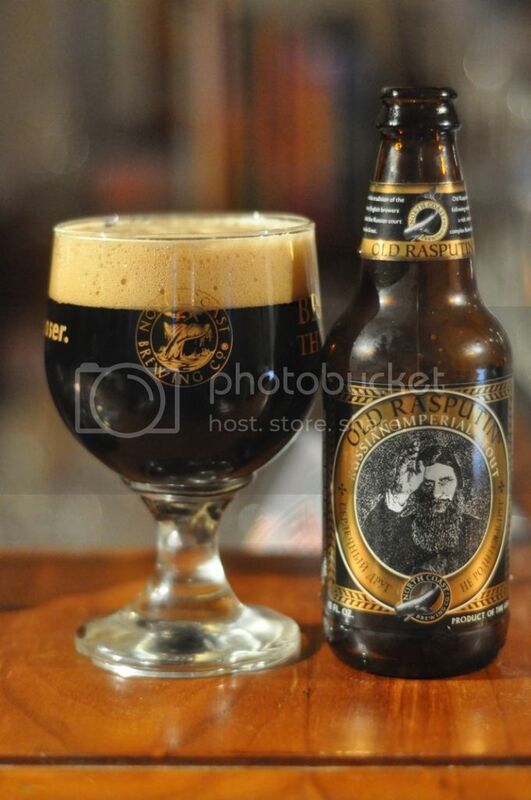 North Coast Brewing's Old Rasputin is one of mine and my fathers favourites and is very rarely not in the fridge. This North Coast glass is one of my favourite glass in my collection. The gold really shines when you have a dark beer (ie. Old Rasputin) in this glass, it just looks fantastic! Anyway North Coast is a brewery I've had alot of beers from but don't actually know that much about. This I imagine will change in the future but for now it's time to review one of my favourite stouts. Old Rasputin pours a very dark, almost black, colour with brilliant hints of ruby throughout the beer as the light passes through it. The head is quite large for the style and is of a tan colour with some bubbles permeating it. In terms of retention this beer isn't too bad and it does lace the glass although the lacing is quite short lived. Still it's a really nice looking stout. The nose is quite hoppy at first for a stout, they are big and bitter, but are very quickly swamped by coffee and roast aromas. There's a fair bit of chocolate on the nose as well, which is always nice in a stout. As the beer warms up there are some hints of dark fruits, mostly cherries and figs I think however I could be very wrong here. North Coast very rarely fail to deliver and Old Rasputin has definitely lived up to the earlier rap I gave it. It's quite a thin stout, which makes it incredibly drinkable and not cloying at all. Despite the thin body it has a very full on flavour. In my opinion it's one of the best Russian Imperial Stouts on the market, if you're a stout person and haven't had this one; I can't recommend it enough, go get some!